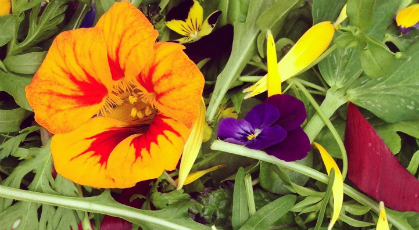 The finest edible flowers and herbs. Hand picked just for you! bring the style of a masterchef to your cooking. Colourful petals such as tulip, chrysanthemum, dahlia and tagetes bring flashes of elegance and colour that lift presentation from good to exceptional. Your guests will be delighted, and the excitement and curiosity of something so beautiful on a plate has to be seen to be believed! 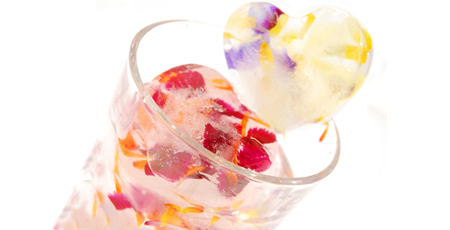 freeze edible flowers in ice to make the ultimate frozen ingredient for cocktails, sangria or any summer drinks - pitchers of juice, lemonade or just water are transformed by the prettiest ingredient we know. 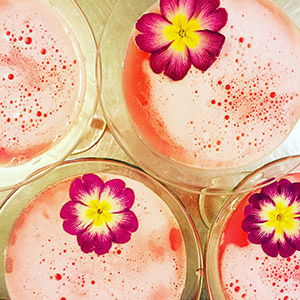 ice lollies made with edible flower petals are delightful! 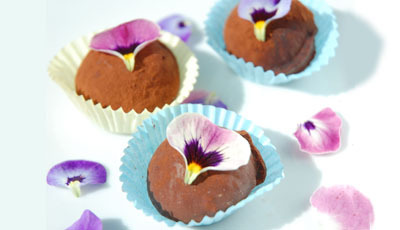 colourful, pretty and playful, edible flowers make sweet treats exquisite. There is no need for garish icing when you can easily use nature's colours to make an indulgence simply beautiful. You can also crystallise our flowers in your own kitchen, and make them sweets in their own right! fragrant, light and full of colour, flowers and herbs make cakes and cupcakes spectacular. 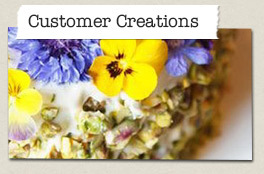 Edible flowers for wedding cakes are perfect for that most joyous of days! add colour vibrancy and flavour to green salads, from the subtle sweetness of the viola to the peppery punch of a nasturtium. 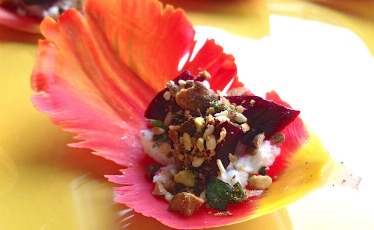 the delicacy of edible flowers, a vegan product, works brilliantly in vegetarian food. 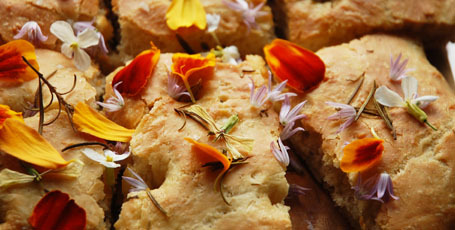 herbs and edible flowers are perfect to include in breads, scones, biscuits, pizza, and all forms of baking, as they bring flavour, lightness, texture and colour. Flowers and herbs for cocktail heaven! 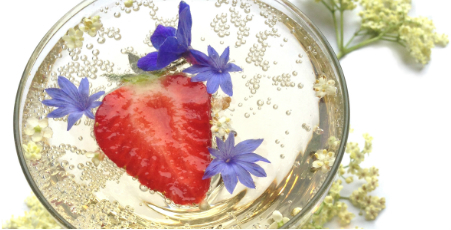 Edible flowers are the natural way to bring a stunning finish to the food and drink you love. We grow many varieties of edible flowers in the UK, from blue anchusa and borage to vibrant calendula, with saffron-like petals. 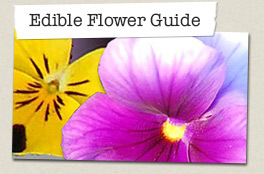 They bring gentle flavour, for example: sweet and fragrant viola, wonderful on dessert, cake or frozen in a cocktail, nasturtium flowers, juicy and peppery, or radish flowers, delicate white and pink colours and delightful salad flavour. We only pick the best for our seasonal selections, and we are happy to put together special orders to your specific colours, themes and tastes. 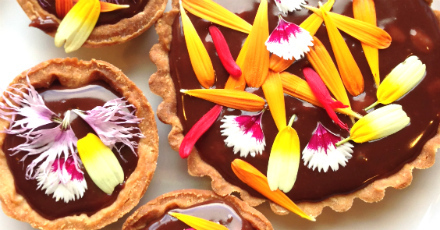 Edible flowers are naturally vegan, gluten free, GM free and contain no preservatives or additives - just pure natural beauty. 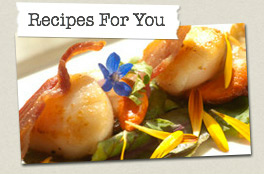 Check out our recipe videos to see them in action!